But larvae depend on feeding on organic matter in unclean standing water. If they get too hot or cold, don’t find enough food, or can’t breathe regularly at the surface of calm water, they will develop into adults either slowly or not at all. Underground breeding: Out of sight not out of mind! It is often observed that mosquitoes become more numerous in wet weather, because they find more attractive (to them) surface-level breeding water (as long as there isn’t so much rain that the eggs, larvae, or pupae are washed away or drowned). But in built-up areas, we often notice more mosquitoes in dry weather. That is a pretty sure sign that they are readily reproducing in water that does not dry up in dry weather. 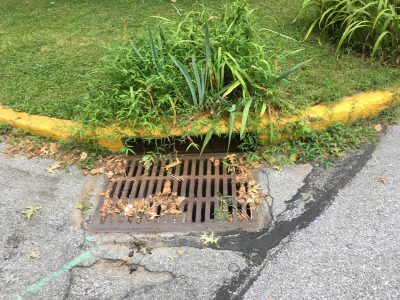 One place we may not think of looking is in drains on our property, which may catch water from driveways, natural surface draining paths, or downspouts off roofs. Here we see a largish drain in an individual yard, into which water can flow either from higher ground or from storm drains on streets higher up a sloping terrain. If you have such a drain, please look down it with a flashlight 4 or 5 days after a rain. If there is water sitting there, you are about to breed mosquitoes and should apply the bacteria-based larvicide. Any significant rain would wash out the future mosquitoes… and also any larvicide; so we need to remain alert to conditions. Bti is widely used to stop larvae from growing by preventing their digestive tract from functioning. See more on Bti here. Mosquitoes also like to breed in municipal storm drains. Storm drains are the drains at street level where rain water pours down into what is known as a sump or catch basin. Any water that stands in the sump provides an ideal mosquito incubator: stagnant, organic-rich, and undisturbed (at least, until the next rain). Theoretically water should drain out entirely after the rainfall ceases. It’s hard to see if a sump really does drain but sometimes you can look down with a flashlight. Are stormwater catch basins significant production areas for WNV carrying mosquitoes? Catch basins can be important production areas for mosquitoes in the genus Culex (the primary vector of WNV in Pennsylvania). Many storm drain systems are designed to quickly direct water from impervious surfaces to nearby streams. Sometimes these systems can become clogged with debris, which can lead to standing water and mosquito production. Malfunctioning systems should be reported to local authorities for repair. Older catch basins were designed to trap debris and hold a small portion of the storm water after a rainfall event. These catch basins are a significant source of mosquito production and need to be treated for mosquito larvae on a regular basis. Some counties actively treat catch basins with mosquito larvicides to prevent mosquito production. Here we see a storm drain, also fortunately dry even the day after a rain, at the corner of two streets. Many cities routinely larvicide their storm drains, such as San Francisco, which larvicides 23,000 storm drains and has no mosquito problem. 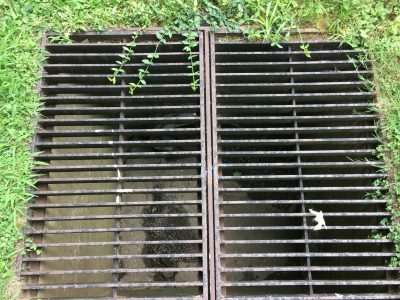 Alexandria, VA, an old town like West Chester, determined that storm drains were their main location of mosquito breeding and applies larvicide to fight the problem. Shaker Heights, the community on which we modeled our proposed West Nile Task Force Plan, larvicides all of its 850 drains. Whether or not storm drains hold water right under the edge of the street, it is very hard to construct a large underground pipeline that has no dips or other irregularities that could hold stagnant water. In case of doubt, let’s larvicide! How far along an underground pipe (from either the drain end or the outflow end) will a mosquito fly to lay eggs in stagnant water? How long might water stand in an underground pipe before is leaks out or evaporates? Would any larvicide in the sump be carried into depressions in the pipe by a light rain but be carried out the end of the pipe by a strong rain? What is the water temperature in storm drains and downline pipes and what temperature range suits mosquito larvae? We just haven’t seen good answers to those questions. We did measure the surface temperature of water standing in a storm drain on an August afternoon. The air temperature was about 78 degrees and the water 70 degrees, definitely in the mosquito comfort zone. In research we have found, mosquitoes favor 80+ degrees and their larvae develop more slowly as the water gets cooler, but they definitely mature down to at least 50 degrees, maybe less. Local science experiment, anyone? If some observant citizen noticed a swarm of mosquitoes flying out of a dry street drain, that would be valuable evidence, as it would suggest that they grew to maturity farther down the pipe underground. Or, if we could put a mosquito netting over a storm drain 5+ days after a rain, we might see what comes out. Until we know more, DSM feels it is important, at least in hot dry weather and when mosquito numbers are rising, to get larvicide into any water standing in a drain or farther down the pipe, especially in flatter areas. This could involve mixing some Bti in a quantity of water and pouring it down suspect street or residential drains. Anyone who has thoughts or experience in this, please let us know! *For a quick outline (and appreciation of how varied and adaptable mosquitoes are), see “Life cycle” at American Mosquito Control Association. Or, for more detail, West Valley Mosquito and Vector Control District. **Or out of sight above our heads! We also need to be sure the gutters than drain off water from the edge of roofs are unclogged and do not hold rain water. ← Citizen measures for mosquito control become more urgent!